First published in 1930, I Am Jonathan Scrivener concerns the unlikely adventures of James Wrexham, a disillusioned clerk of almost forty who has achieved little in his uneventful life. Wrexham considers himself not only to be a lonely man but to be defined by loneliness, yet - unlike many lonely people - he feels this has enriched his understanding of others. I have known years of loneliness and there is a type of experience which is revealed only to the lonely. During those years I was forced to learn a good deal about myself and that knowledge taught me what to look for in others. If you have been behind the scenes, you never regain the illusion which belongs to a person who has always been simply a member of the audience. Fearing stagnation, Wrexham impulsively decides to apply for the job of secretary to Jonathan Scrivener, a 'gentleman of independent means', via an advertisement in the Times. Much to his surprise, Scrivener employs him without the two of them meeting or even speaking. He's even more baffled when Scrivener, who is abroad, issues instructions that Wrexham should move into his flat immediately, make himself comfortable and fully enjoy the advantages of living in London. This turns out to involve meeting and socialising with Scrivener's many friends, who turn up at his doorstep (and in some cases inside the flat itself) expecting Scrivener to be there. They are: Pauline, a young, beautiful woman with great innocence and an inquisitive nature; Middleton, an alcoholic troubled by his experiences in the war and the loss of his fiancée; Mrs. Bellamy (Francesca), a woman made famous by the suicide of her extremely wealthy husband; and Rivers, a flighty young man and something of a social butterfly. These characters, Pauline and Francesca in particular, are each richly imagined in their own right. What binds them all together, Wrexham included, is a desire for something more than the conventional life they have been offered, and rejection of the options they have before them. But each of them is uncommonly obsessed with Scrivener, something made to seem all the more unusual because they are so different in character, age, class, and experience. I Am Jonathan Scrivener is very much a book of its time, and it's one of a very, very small number of books (Mrs Dalloway being another) that really made me think about what life and society were actually like during this period. The contrast between the prudish austerity of the Victorian era, so recent in the memories of many, and what is depicted here as the flippancy and flamboyance of 1920s/30s youth; the aftermath of war and the feeling that society was a new, reshaped thing. Wrexham's narrative often involves commentary on London and on society in general, as he observes life in a city much changed from the London of twenty years before. These observations are compelling as a snapshot of this particular period, a world which had seen cataclysmic change and would be upturned again within a decade. They are sometimes amusing because they're still relevant now - and sometimes because they're very much the opposite. Wherever I went, whatever the time, there were hordes of people—restless, irritable, or apathetic people—staring into shops, herding into 'buses, or waiting impatiently to cross streets which were congested with every type of vehicle, capable of every variety of speed. The gloom, particularly in the faces of the men, was remarkably apparent. In a thousand unsuspected places he results of ordeal by battle were unmistakably clear. These people were weary, sceptical, disillusioned. They sought for pleasure with all the feverish activity of the unhappy. I discovered that modern people never smile. They either shriek with laughter or look as if funerals were the order of the day. The dignity of which we English used to boast had vanished; everyone was slightly hysterical and seemed to be waiting for something to happen—half hoping that it would, yet half terrified that it might. The conversations I heard were always about money... a car of any sort was regarded as the highest pinnacle of human felicity. The garage has become our spiritual home. ... Everyone was exceedingly class conscious when the plain fact of the matter was that classes had ceased to exist and everyone now belonged to one vast undifferentiated mass. Democracy had triumphed at the precise moment when everyone had ceased to believe in it. Politics had become a longer word for chaos. At the time of which I am writing the Conservatives were in power... The Labour Party was far too busy preparing its programme, or dealing with revolution in its own ranks, or explaining that it had not stolen its panaceas from the Liberals, to spare any time for effective criticisms of the Government's proposals. Meanwhile, as ever, the country was run by the Civil Service. At one point, someone makes the remark 'something will turn up - another war or something' - a comment that would have made me roll my eyes had I encountered it in a contemporary novel set in 1930, yet it seems fascinating to find it here. This is also a very funny book, albeit one with a rather dry sense of humour. One of the most amusing scenes occurs when Rivers takes Wrexham to a Japanese restaurant, a place he clearly finds confounding in the extreme. It was at this point that the first course appeared. It consisted of odds and ends of dry, very dead-looking things. I tried one which looked like a mushroom of great antiquity, but it turned out to be raw fish. Although it resembled spaghetti, recent experience had proved that in this restaurant things were not what they seemed. Nor did the fact that one solitary prawn crowned the writhing pyramid inspire me with any confidence. "Looks like spaghetti," said Rivers, "but it isn't." I waited, hoping he would say what it was, but he began to eat in the manner of one performing a rite. As tactfully as possible I inquired whether coffee in this restaurant in any way resembled the beverage usually associated with the word. On being assured that it did, I accepted a cup. It was coffee. I drank it quickly, fearful that its surroundings might pervert it. Rivers was an entirely new experience for me. Not only had I never met anyone remotely like him, but I had never imagined such a person as a possibility. ... He paused, studied me with the eyes of a superman, then asked if I could lend him a tenner. The atmosphere was so charged with the philosophy of "live dangerously" that I said "yes". Naturally, given the strange circumstances surrounding Scrivener's character, the plot progresses as a mystery, as Wrexham tries to piece together the reasons for his employer's patronage of such a mismatched group of individuals - not to mention his own mysterious installation in the role of secretary. If this was a modern novel, it would no doubt build to some revelation about Scrivener - he doesn't really exist, or he's several people, or Wrexham himself turns out to be Scrivener, or something. But while the ending holds a small twist, the story is less about this conundrum than the fact that it brings Wrexham into the others' orbit and transforms not only his day-to-day existence, but his whole belief system. Similarly, while it becomes apparent towards the end that Wrexham is an unreliable narrator - something particularly evident when he speaks of a hitherto unmentioned love for Pauline and also alludes to having been affected by an unknown event, years ago, 'which made me content to become a spectator of life' - we never get to know anything more about him than he has disclosed. That event, whatever it was, remains concealed. In the final few chapters, Wrexham's grip on reality loosens; he becomes both paranoid and intensely philosophical, puzzles out the connections between Scrivener's friends, and at the same time imagines they might really have been Scrivener's accomplices, acting out parts, and that Scrivener's servant is spying on him. I Am Jonathan Scrivener is a sort of mystery, making it a compulsive read, but more than that it is simply a story about people, their psychology, their differences and depths of character, what they might be driven to accept or reject given a wealth of opportunities. 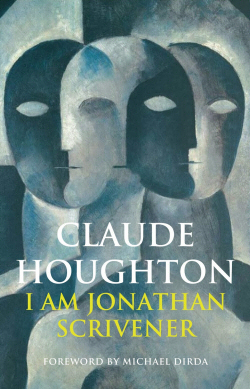 Through his characters, especially his brilliantly drawn women, Claude Houghton explores the questions any person might ask about their own life, and depicts a search for meaning and purpose that is timeless - but the fact that this is so clearly positioned in the time it was written gives it an extra layer of interest for the modern reader, since it shows how social turbulence and the after-effects of conflict might contribute to such existential interrogation.